Web content management (WCM) is the process of controlling the content to be consumed over multiple digital channels through the use of specific management tools based on a core repository. 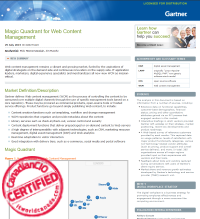 In this Magic Quadrant, Gartner assesses the top WCM vendors. WCM remains a vibrant and growing market, fueled by the aspirations of digital strategists on the demand side and continuous innovation on the supply side. IT application leaders, marketers, digital experience specialists and merchandizers all now view WCM as mission-critical. Download this Gartner Magic Quadrant to find out more about the leaders, challengers, visionaries and niche players in the WCM space.